Here's the Christmas version of the flip/swing card I made 2 weeks ago for my neighbor. This pup looks just like her little white dog. She plans to send this to her sister for Christmas. Sorry the photo isn't very good. I just finished the card and only had a few minutes to snap a pic before I met with her. 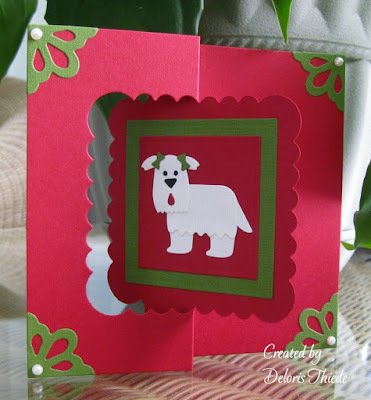 I used a Sizzix die for the card base, Spellbinders Nestabilities dies for the squares, Whimsy dies for the photo corners and a Quikutz die for the puppy. Awww, your neighbor's sister will be tickled when she receives this adorable are you made. So sweet. Just a heads up-your About Me profile still links to your "other" blog-just saying if it matters!